Daria Tartrais graduated with the Cuisine Diploma in 2015. She has since created a catering service representing her values: vegetarian, seasonal and eco-friendly. She tells us more about her life as a Le Cordon Bleu Paris alumni. Can you introduce yourself and tell us what you did before studying at Le Cordon Bleu Paris? My name is Daria Tartrais and I am from Belorussia. Before coming to Le Cordon Bleu, I was studying linguistics and then went to Vilnius University to study cultural heritage and tourism. It was distance learning, so I was living in the Netherlands to earn some money and improve the language. What made you want to study at Le Cordon Bleu Paris? Cooking has always been a passion. Since I was a little girl I spent all my free time my grandmother’s garden, looking for the special ingredients and spices to cook my creations. It came to me naturally, but I knew that although I was practicing a lot, I had to learn the techniques in a professional setting. Unfortunately, there was no cooking school in my country, and gastronomy is not part of our culture. I kept this dream in my heart until I became independent and was able to realise it. The first thing I did was to check the best culinary schools in the world and found Le Cordon Bleu! Thanks to my grandmother who helped me make my dream come true. 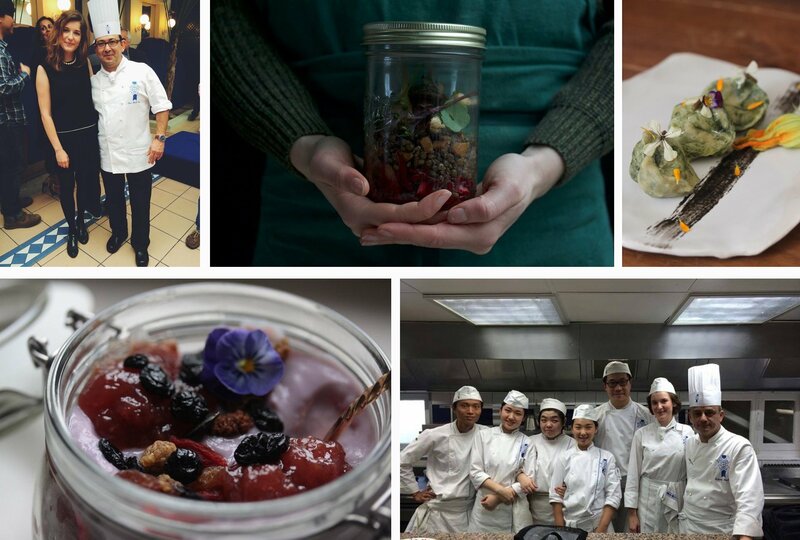 What is your best memory at Le Cordon Bleu Paris? Basically, all the memories were the best in my life, it was such a new experience, beyond my expectations. On the first day, I was afraid about how things would go but as soon I entered the classroom I was inspired by everything that was happening. I made so many friends from different parts of the world, we had a lot of fun, and learned so much. Every Chef was unique, I never got bored, they were always keen to teach us something new, and did it with great passion. I also met my husband at Le Cordon Bleu, so I will never forget this beautiful time! I would like to tell them to never give up their dream, to believe in themselves and remember that education will eventually bring us to our dreams, make us better and bring even more joy than we might expect! If you want to become a chef or open your restaurant, you should go through all the details, techniques and history to build your fundament. Can you introduce your new business? How did you come up with this concept? After graduating I straight away started to work in French restaurants. I wasn’t afraid of having to wash the dishes or being a commis. Luckily, my Cuisine Diploma helped me get a lot more confident when I started looking for a job without any experience in this field. I worked around 3-4 years and finally decided that I got enough experience to realize my dream. From 15 years old I was keen of vegetarian food. People always had prejudice about this cuisine, and I always tried to make delicious vegetarian dishes to prove them wrong! French gastronomy uses a lot of vegetables, so I also learnt various techniques and recipes when I was studying at Le Cordon Bleu Paris. My idea was to familiarize people with the seasonality of products and teach them to cook these grains and vegetables differently. I was also thinking about eco-responsibility, so I am using my bike to deliver my food in glass pots. My concept is a "slow food" catering service: the food is cooked with love and passion, 100 percent homemade, from local products and respecting nature. I am working on a restaurant project with the same concept: menu will change daily, and will be based on seasonal products. I would also like to take the Pastry Diploma and finish my nutritionist diploma. I want to say thanks to Le Cordon Bleu Paris to help me never give up becoming a chef. Also, say a big thanks to Mamie Mesure, my last employer, (where I was cooking vegetarian food) who trusted me and gave me lots of opportunities!